From the entire board of Directors & me we wish you all a wonderful and delightful holiday season. May you get all the things that you ask Santa for on your Christmas list. We must also remember all our service men & women who make it possible to continue to celebrate this joyous season as free individuals. Please take a minute each day and thank the good Lord for all we have and pray for peace in the near future. Once again “Merry Christmas & a Happy New Year to you all” See you at the races in 2007! 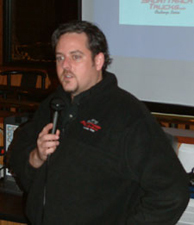 With a great crowed on hand at our November general meeting at Capers Restaurant our first guest speaker for the evening was Cary Cole Promoter of the Short Track Trucks.Com Challenge Series. Cary had a great presentation with a slide show that informed us of how his series started and where it is heading in the future. He also talked about how some of the younger drivers from the go-kart & quarter midget series have moved up to run in his series and they are doing a great job each and every week. 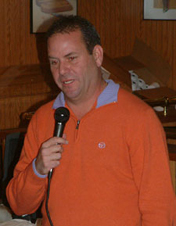 Next up we had Eddie Sachs Jr. who spoke about how his first season as the new host of Motor City Motor Sports went. Eddie said he is working hard at getting the show on the web cast deal as well as getting it broad cast in the Metro Detroit area and not just in the Flint area like it is now. We wish him luck for his next season. Dennis Worden from MIS was scheduled to be with us but was sent at the late minute by the speedway to get things set up for the last race at Homestead. Dennis hopes to be able to be with us at one of our spring meetings soon. MARFC was excited about being invited once again to participate in the annual Mt. Clemens Christmas Parade held on the Friday after Thanksgiving. Even with the heavy fog that set in early Friday morning that went away just as the parade was to start we all had a grand time. Special thanks to Frank Jiovani and his family for bringing his Michigan Legends car and displaying it during the parade. Thanks also to the Michon Family for the use of their truck to hall the giant polar bear we had. We look forward to returning again next year. First off this month I’d like to send out a few get well wishes to some club members. Larry Loynes who is the announcer of both Dixie & Auto City Speedways had a fall awhile back and is on crutches again this time it is his other knee that was injured. Also Terry Fitzwater’s better half Pam is in need of our thoughts and prayers as she is still not doing well after suffering a stoke back in the summer. Terry we send our regards to you and Pam. “Poor Paul” Zimmerman was also under the weather for awhile and I just heard he is still not doing well at all. May all of you Get Well Soon! 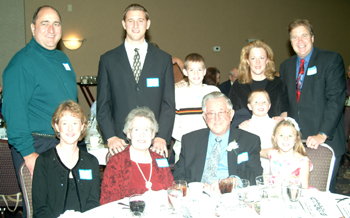 The Michigan Automobile Racing Fan Club was proud to see the first President and one of the founders of our club inducted into the Michigan Motor Sports Hall of Fame on November 5, 2006. 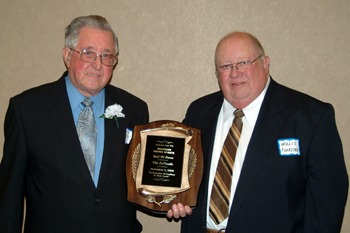 With nearly 50 members on hand Vito was inducted by one of the other club founders Willis Flokstra. Many of Vito’s friends and family members were also on hand to see him receive this great honor. From all of us here at MARFC once again we say Congratulations Vito it has been along time coming. We had a large group attend the October meeting. 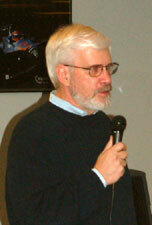 Our first speaker was Bob Capps and he spoke to us about the magazine he writes for Vintage Oval Racing. He just finished a great story on Joy Fair last month and this month he has a good one with Benny Rapp. Bob also talked about Kart 2 Kart that he does the PR work for. Next we were treated to a slide show presentation on Motor City Speedway that Al Blixit Jr. set up from the 30’s through the 40’s. Boy was it outstanding and he is working to put together a book and have it out late next spring. He brought many photos for all to look at after the meeting. 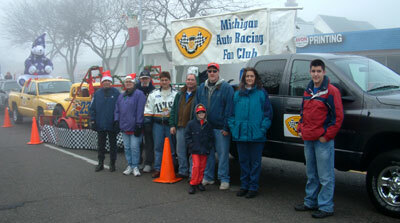 Many members recalled a lot of stories from the old Motor City days. So here we are with another season over with so soon. Congratulations to all the champions in all the various series as well as all the track champions. The banquet season is upon us and it will be a busy one for all I am sure. Our October meeting is on the 14th at Kart 2 Kart at 7:00pm located on Van Dyke just south of 19 mile road in Sterling Heights, MI. 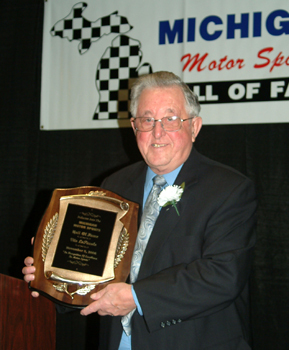 Our guest speaker will be AL Blixt Jr. who he and his father have taken many photos of racing at Motor City Speedway and Mt. Clemens Race Track to tell us about his new website about both racing facilities. AL will have a slide show of photos on hand for all to see & enjoy. Also don’t forget to RSVP to the Annual Children’s Christmas Party to be held on December 3, 2006. We have also marked down all of our MARFC Wearable Shirts to 50 % OFF of what we have in stock at this time. We will be making room for our new line of wearables for 2007. Please e-mail me to see if we have what you would like still in stock. Mother Nature gave us all a run for the money but the staff at the Toledo Speedway pushed the show along. All the members who attended were treated to some outstanding racing with the USA Modified, ARCA Figure “8”, ARCA 4 Cylinders, and Factory Stocks along with the Flat Rock B & C Main Street Stocks and with the Late Models practice session. After the Modified and Figure “8” features the rains came during the Street Stock/Factory Stock feature just past the half way point and the night was called with no 4 cylinder feature run. The rains came again the next day and cancelled the Glass City 200 Late Model race and forced them to run on Sunday the rain date. Many Thanks to Ron Drager, Roy Mott, Scott Schultz for given our members an extra Fan Club Day event for the 2006 season. Paul Anton Photo. Yes it is that time of year where we say RENEWAL TIME EVERYONE! Be sure to get your renewals in before the end of the year. I know so many say it’s too early but with the holidays coming up and all the banquets around your renewal can slip by and not get done. Also remember to please e-mail me your new e-mail address ASAP so we can put you on the online newsletter list and up date our records. So many of you have changed and we still have a few who have not set up your mail to allow your newsletter to come through. We get many returned each month as undeliverable because of these things. We do appreciate many of you who get the online newsletter only so we hope to update all your address soon. Many thanks again! AUTO CITY SPEEDWAY: Weather was great and racing was outstanding. Board members Fran Russo & Laura & Jimmy Tucker were on hand to welcome members. Chuck & Jeff Horan and Tony Russo also assisted at our table for the evening. Our MARFC Uniform/Helmet Bag was given to Led Sled # 34x driver Manny Martinez for his continuous support of his division at the speedway. Many thanks to Joe DeWitte and staff for making arrangements for us to make up our fan club day event after it was rained out back in May. 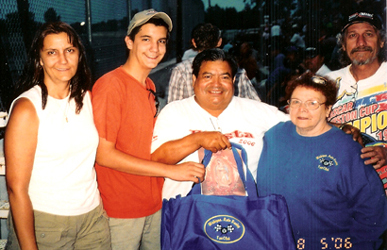 MICHIGAN INTERNATIONAL SPEEDWAY: What a great day we had for our day at MIS. 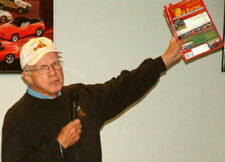 All members who attended this event saw an outstanding ARCA race as well as NASCAR Cup & Busch practice & Cup qualifying. We would like to send our very Special Thanks to President Brett Sheldon and Bill Janitz for all they have done for our club over the past few years. Both Brett and Bill will be leaving MIS to pursue other business opportunities. We are looking forward to working with the new staff in the future.